Werder Bremen has managed to win all 4 games after the winter break and they have at this moment 29 points and are getting closer to the european places for next season. Just that in this game they have a tough task in getting something out of this game away at Schalke 04, which is playing good football, despite the loss in the Champions League 2-0 to Real Madrid. 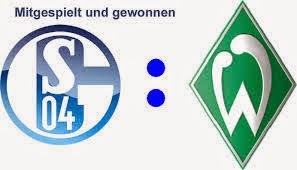 Of course Schalke's defense is not perfect and Werder is scoring plenty of goals lately, and I am expecting them to score here and the game to have over 2.5 goals by the end.